103 illustrations (96 are b&w and 7 are in color). UNDERSTANDING LAVA TUBES AND LAVA CAVES takes you inside an active lava flow. * The two methods of lava tube formation are explained. * The various internal processes responsible for changing the size and shape of a tube, are revealed. * You’ll learn how air shapes delicate cave features, and changes the color of the rock. * You’ll be amazed by the incredible diversity of formations found in lava caves, and understand how they form. * And finally, you’ll discover that not all lava caves, are lava tubes. Other types of lava caves do exist. In addition to this, you are given practical information about lava tube caving, and preservation. And there is a Question section which provides further information. Sections are well illustrated, informative, and interesting, making UNDERSTANDING LAVA TUBES AND LAVA CAVES a must have for anyone wanting to learn about this fascinating environment. Harry has devoted several thousand hours of the past 21 years exploring lava caves, assisting in cave surveys, and giving lava tube tours. Today, he primarily guides lava tube tours in Kazumura Cave where he teaches visitors about lava tube geology, while stressing preservation. An impressive presentation of a considerable amount of information regarding the formation of lava tubes; I was quite impressed with the content of this book. It is easy to read and understand the many of aspects of cave formation. They are presented in a format that does not make one feel like you must have a doctorate to "get it". I was fortunate to participate in an on-site tour as well. Harry Shick is very knowledgeable in his field and most capable in relaying the information in everyday language. Taking his tour is just amazing. He is ready and willing to answer all questions presented. I highly recommend this small book. VERY INFORMATIVE BOOK Review by Kent Henderson. This very informative book is written by Harry Shick, a guide Kazumura Cave in Hawaii – at 65.5 km reputedly the world’s longest known continuous lava cave. The book deals with Lava Tube Formation; Processes that alter the size and shape of a lava tube; Air – the Second fluid; Formations and Features; and Other Lava Caves. Appendices include Caving in Lava Caves and Preserving the Cave Environment. The book also includes a Glossary, References and an Index. It is profusely illustrated with diagrams and images. This small book is a good read, and more importantly an excellent text on lava tubes and their formation. I highly recommend it. After enjoying the Kazumura Cave tour while in Hawaii - a high point of our trip! 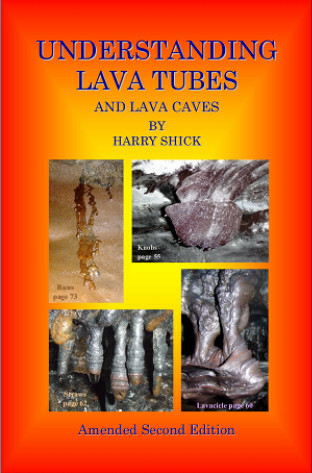 - I settled down to read Harry Shick's "Understanding Lava Tubes". I thought I had learned a lot while on tour, and was unprepared for the logical thoroughness of the book. Speaking as someone with 30 years professional background in analytic writing, this little book is a masterpiece of clarity. Backed up by a series of clear, simple diagrams and photographs, it makes the mechanics of lava tube formation, and their complex features, flora and fauna easily understood. The author and guide has spent many years studying and investigating such caves first hand, and probably has a unique understanding of them which was obvious in both the book and the tour. Recommended as an essential accessory for anyone who tours Kazumura, but also as a reference for academics and teachers who need to explain lava tubes to students.